Gil Morgan shot a 65 yesterday for the first-round lead at the Turtle Bay Championship. Morris Hatalsky sits two back. Gil Morgan had two eagles in four holes -- including a chip-in from about 45 feet at the par-5 ninth -- to take a two-shot lead at the $1.6 million Turtle Bay Championship. Morris Hatalsky escaped a large group with a birdie at the final hole to finish at 5-under 67. There were seven golfers tied for third at 4-under 68, including Champions Tour rookies John Cook, Bernhard Langer, Phil Blackmar and Fulton Allem. Joining them within shouting distance of Morgan are veterans Tom Kite and Jim Thorpe. Former Kailua resident Scott Simpson was among another seven golfers at 3-under 69. Hawaii resident Dave Eichelberger managed a 2-under 70. Hawaii Golf Hall of Famer David Ishii didn't fare as well, opening with a 6-over 78. A typical tradewind pattern pounded the Palmer Course, with showers falling late in the day. Tee times have been moved up to 9:30 a.m. today in case bad weather awaits the 78 golfers playing in the first full-field event of the 2008 season. Gil Morgan really didn't play a different course yesterday -- it just seemed like it. Riding the back of two eagles in four holes, the 61-year-old good doctor shot a sizzling 7-under 65 to build a two-shot cushion over Morris Hatalsky (67) and a three-shot advantage over seven others entering today's second round of the $1.6 million Turtle Bay Championship. Playing in the normal trades, the 78 golfers in the first full-field event on the Champions Tour did a good job taming the par-72 course designed by Arnold Palmer. There were 33 who landed in the red and 45 players who shot par or better. But no one could catch Morgan, whose only blemish was the bogey-par finish that left a nasty taste in his mouth. 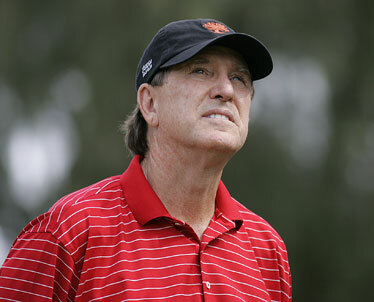 It could have just as easily been par-birdie that would have given him the kind of lead Fred Funk managed on his way to a senior-tour-record 11-stroke win last year. That's unlikely this time around with 21 players within five shots of the lead. "It will be hard to improve on this round," said Morgan, who won last year at the Wal-Mart First Tee Open. He has 25 victories on the senior circuit, including five over the last six years. "I thought if I could birdie one of the last three or four holes there -- and of course with 18 being a birdie or an eagle hole, if you do the right things -- I thought I could get to 10 under pretty easily. If I make one birdie and then knock it on the green in two there (at No. 18), then two-putt, at the worst. So it wasn't out of the question at that point." Hatalsky birdied the last to pull out of a logjam of golfers at 4-under 68, including Tom Kite, Bernhard Langer and John Cook. Cook birdied the 18th to move into contention. Kite missed a makable 6-footer at the end to remain at 4 under after 18 holes. Tour rookie Fulton Allem, Phil Blackmar and Donnie Hammond also managed 68. Langer joined that group with an eagle at the last. So can Morgan hold off this talented field of mostly younger golfers? Does he have enough magic left in his bag to win at a place where success has rarely found him? He isn't sure. What he does know is he plays well in the wind at times and not so well at others. There seems no rhyme or reason as to why his craft comes and goes in the breezes. What we do know is the tour is moving up the tee times and has the golfers going off on both sides to anticipate some sketchy weather headed this way. When Funk shot 23 under last year, conditions were benign. Not so this time around, giving everyone a better chance at shooting 12 under or so for the tournament, and picking up a win in this 54-hole event. Not that Morgan hasn't won in the wind. In 1998, he captured the MasterCard Championship at howling Hualalai. What's normally a birdiefest was anything but during the first round, where Morgan had the only score under par. He went on to win by six strokes that year, something he'd like to match in this tournament. "I remember on the par-5 10th hole that day I hit driver, 3-wood, 3-iron," said Morgan, who was first in driving distance yesterday, averaging a healthy 286 yards off the tee. "It always kind of funny conditions over here. It's either misty rain or blowing, gusty; funny lies in the rough, sometimes. Chipping around the green is kind of tough. "I like it when conditions are good, really, myself. I can control the ball a little better. Sometimes I play really well in the wind, sometimes I don't. It's kind of hit or miss." He didn't miss much of anything until the untimely bogey at the 17th and a bad par at the closing hole. It's those kind of things that come back to haunt you, especially when you have a pack of rookies nipping at your heals. Cook, Allem, Langer and Blackmar are making their first real tour of duty on the senior circuit. This is only Morgan's fourth time to play here. His best finish since starting his current run in 2005 is a tie for 14th in 2006. "The first year I played here I played pretty well up until I hit it into the water at 18 the second day, then Hale (Irwin) went on to win that year (2005)," Morgan said. "But since that time, I haven't seemed to play as well as I like at this golf course. It's always windy, always blustery conditions. I was kind of surprised at my round today."